Here are some of the things we have been recognized for. The team at Voyager RV Kelowna is proud to have been presented with a number of awards and achievements over the years! Thank you to our customers for making this possible. 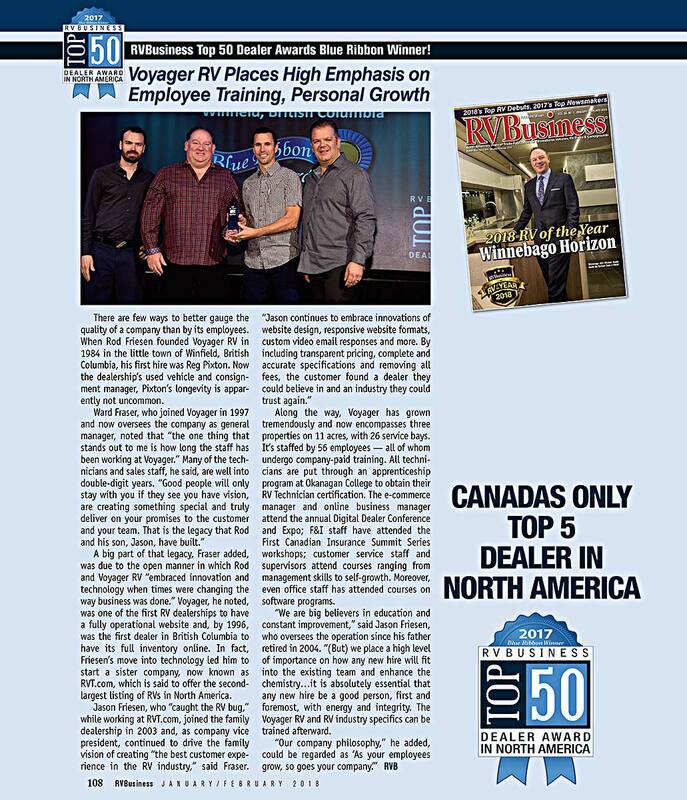 Voyager RV has been named one of the Top 50 RV Dealers in North America for 2015 - 2018 by RV Business Dealer Magazine. This is a prestigious award, as we are the Only RV Dealer in all of Canada to have made this Top 50 in North America list for 4 years running. Best RV Dealer of the Okanagan Award recipient for 16 Years Running. The Recreational Vehicle Dealer Association of BC (RVDA) has awarded Voyager RV the prestigious 2014 B.C. Dealer of the Year award. We are proud and honored by this award and have everyone on the Voyager RV team to thank as this is a result of the hard work and efforts of the great team in all departments at Voyager. TD Auto Finance is proud to recognize Voyager RV Centre Ltd. for their outstanding sales efforts in customer financing in 2013. 2014, 2015 & 2016 Winners of the prestigious Jayco Gold Circle Dealer status. The Gold Circle Club was founded in the early 1980s by Lloyd J. Bontrager and the management team at Jayco to pay tribute to those Dealers who demonstrated outstanding performance in the areas of sales volume, market penetration, customer service and fiscal management. 10-time Winner of the Winnebago Industries Circle of Excellence Award for Quality of Customer Service experience! West Magazine Readers Choice Gold & Platinum Award... 5 - Time Winner! North America’s #1 Northern Lite Truck Camper Dealer for many consecutive years! Top 10 RV Dealer in the Country for Keystone RV Springdale! Voyager RV has been named one of the Top 10 Jayco Dealers in Canada. Continuing Supporter and Member in good standing of RVDA Canada. Proud Member of the Better Business Bureau, BC Mainland. Contributing Member of the BC Vehicle Sales Authority (VSA) promoting compliance and education in the industry.